- Oleg Usyk knocks out Tony Bellew to retain his four cruiserweight titles and end Bellew’s career. - Mairis Breidis and Krzys Glowacki win through to the WBSS cruiserweight semi-finals with wins over Noel Gevor and Maksim Vlasov. - Anthony Crolla moves nearer to another title fight with a win over Daud Yordan in a WBA eliminator. - Yuriorkis Gamboa and Juan Manuel Lopez score wins in Miami and seem headed to a March meeting. - Ricky Burns keeps his hopes of a fight with Crolla alive with stoppage of Scott Cardle and Josh Kelly again impresses with one round blow out of Argentinian Walter Castillo. - Brandon Adams beats Shane Mosley Jr to win the latest The Contender series. - Felix Verdejo returns with a win. 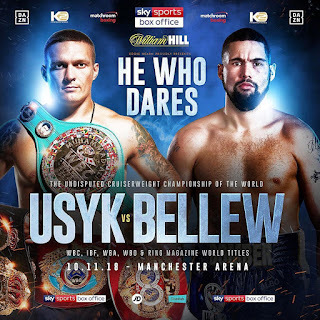 Manchester, England; Cruiser: Oleg Usyk (16-0) W KO 8 Tony Bellew (30-3-1). Light: Anthony Crolla (34-6-3) W PTS 12 Daud Yordan (38-4,1ND). Light: Ricky Burns (43-7-1) W TKO 3 Scott Cardle (23-3-1). Welter: Josh Kelly (8-0) W TKO 1 Walter Castillo (13-3). Heavy: Dave Allen (16-4-2) W RTD 7 Ariel Bracamonte (8-2). Cruiser: Richard Riakporhe (8-0) W TKO 8 Sam Hyde (13-1-1). Usyk sends Bellew into retirement with a dramatic knockout to retain all four cruiserweight titles and put the world’s top heavyweights under notice. Bellew took the lead here. He was poking out his jab finding some gaps and testing Usyk with some straight rights. An overly cautious Usyk hardly threw a punch in the round. Usyk was a bit more active in this round probing constantly with his jab but not really following through with the punch. Bellew scored with his jab and with a couple of rights and was almost taunting Usyk who seemed reluctant to take any chances. A good right from Bellew gave him the round. Usyk stepped up his pace in this one and finally scored with some southpaw straight lefts. He had the better of the early action but late in the round Bellew was getting through with rights to the body and just edged a close round. Usyk now had his right jab working and was following that with straight rights. Bellew had discarded his jab and was relying on lead rights, most of which missed or were blocked. Usyk was on the front foot and keeping Bellew on the defensive and buckled Bellew’s knees with a left and took the round. This was a closer round; Bellew was able to land with his right more than in the last round. Usyk was pressing through the whole three minutes. He was slotting home jabs and landing straight lefts. He looked like a fighter with a game plan whereas Bellew looked as though he was making it up as he went along. A better round by Bellew. After Usyk started the round confidently Bellew began to throw more punches. He was using his jab and letting go with straight rights and was more accurate and finished the round with a strong right to the head. Usyk outworked Bellew in this one. He kept his right in Bellew’s face and scored with thumping lefts to the body. Bellew was dangerous in bursts but Usyk was starting to hound Bellew and two right jabs brought blood from Bellew’s nose. Usyk was working the jab again and then landed a heavy left to the head. Bellew scored with a right and a left to the body but Usyk fired back with two left hooks that had Bellew backing off. Usyk followed landing more lefts and then one finally one sent Bellew down spread-eagled on the floor with his head resting on the bottom rope. He turned looking out into the crowd grabbing the ropes as he struggled to get to his feet but the referee waived the fight over without completing the count. Official scores at the finish: 68-65 and 67-66 for Bellew and 67-67. After a slow start Usyk just got better and better and the brutal knockout was scary. It looks as though there are no immediate plans for the fight with Anthony Joshua that Usyk so obviously wants and with the leading cruisers all involved in the WBSS it may mean an outing at heavyweight for Usyk against a rated fighter before a Joshua clash next year. Bellew won the British, European Commonwealth and WBC cruiserweight titles and beat David Haye twice inside the distance so leaves with his head high after an outstanding career. Crolla wins a unanimous decision over Yordan in this WBA final eliminator. Crolla made a confident start. He was on target with his jab in the first and mixed in hooks to the body and some sharp uppercuts. Yordan was slower off the mark and although increasing his punch output in the second it was the hand speed and some hooks inside that helped Crolla keep the momentum. Yordan had some success when he was able to pin Crolla on the ropes but those were rare occasions. Yordan finally had some significant success in the six. He hurt Crolla with a left to the body and another series of punches had Crolla briefly in trouble. Yordan attacked hard in the seventh which was a close round but Crolla was back in control in the eighth with clever movement, changing angles and slotting home punches. Yordan pressed hard over the closing rounds. He was the heavier puncher and was always dangerous but Crolla matched Yordan’s work rate and with his controlled boxing and greater accuracy he stayed in front to the final bell for a decisive victory. Scores 116-112 from the three judges for Crolla. The former WBA champion has rebounded in style after his back-to-back losses in title fights against Jorge Linares. He scored a good win over Ricky Burns and was No 4 with the WBA going into this fight and this victory over the WBA No 2 rightly gives him in pole position for a fight with Lomachenko. The Ukrainian has a unification fight with WBO champion Jose Pedraza on 8 December and if he gets through that then Crolla will be able to press his case for a title shot. Former IBO champion and WBA title challenger Yordan may have seen his last chance of another title challenge disappear with this loss. A very sharp looking Burns blasts out former British champion Cardle. In a fast-paced first round Burns was using his extra reach to score with his jab and following it in with hard rights one of which shook Cardle. When he could Cardle was slipping Burns jab and scoring with hooks inside. Cardle made a busy start to the second but Burns used his jab to take control and twice connected with left jabs followed by right hooks and landed two more rights to the head at the bell. Burns was throwing rights in the third and a cut was opened under Cardle’s left eye. As Cardle came forward a thunderous right to the head from Burns saw Cardle’s legs go stiff and he toppled down to the canvas. It was a brutal knockdown but somehow Cradle dragged himself to his feet but the referee having counted eight sensibly waived the fight off. The 35-year-old Scot is hoping to get a fight with Anthony Crolla but Crolla is looking towards another world title shot so Burns may have to keep busy and see what transpires but this win will have boosted his confidence. The wheels have really come off for Cardle. He has gone from 21-0-1 and British champion to losing his title and three of last five fights, with two of those losses crushing early stoppages. Kelly dismantles overmatched Castillo inside the first round. From the opening bell Kelly was snapping out his jab and throwing sharp straight rights. Kelly connected with a left hook to the body and Castillo got through with an overhand right. Kelly then unleashed a series of hooks and uppercuts that had Castillo floundering and a right cross put the Argentinian down. He beat the count but when the action restarted Kelly was driving Castillo around the ring with hooks and uppercuts. Castillo tried to fire back but was on the ropes and under yet another bombardment and the referee stopped the fight despite protests from Castillo. Just a mark-time fight for Commonwealth champion Kelly. His next date is set for 8 December against former IBF title challenger David Avanesyan which will be a much sterner test. Castillo, the Argentinian No 7,suffers his third loss in his last four fights. It was all bludgeons and no rapiers here as these two big men tried to beat each other down with Allen coming out the winner. Bracamonte was finding plenty of gaps for his punches in the first but did not seem to have the power to halt Allen’s attacks. Allen landed a very low punch in the first and got away with another in the second. Bracamonte kept landing and seemed on the point of overwhelming Allen in the third but Allen saw out the storm kept coming and just before the bell a thunderous right had Bracamonte seriously shaken. The Argentinian looked exhausted and close to quitting but Allen was just as tired and in a brutal fourth they both landed hefty head shots as the “pace” slowed to less than walking and they both took and landed tired punches. It was a battle of attrition. Bracamonte tried to box in the sixth but did not have the energy to sustain the effort and it was Allen’s bombs that were having the biggest effect. Bracamonte came out wildly throwing punches in the seventh but a counter right from Allen open a gash on the bridge of Bracamonte’s nose. With Allen walking Bracamonte around the ring and connecting with huge right swings the fight needed to be stopped but it wasn’t . Bracamonte’s corner sensibly retired their man at the end of the round. Allen gets the win but he can’t take many more wins like this. His defence was non-existent but he walked through the punishment which is fine against fighters such a Bracamonte but not against quality fighters. Bracamonte is No 1 in the national ratings which tells you all you need to know about the situation of the heavyweight division in Argentina. Unlucky night for Hyde as he is well on his way to victory until a terrible swelling by his left eye sees the fight stopped. Hyde built a good lead he was quicker and had no problem in getting his jabs off first and getting past Riakporhe’s jab and connecting with sharp left hooks. In the sixth Riakporhe finally started to connect with rights and land some heavy body punches. He was pinning Hyde to the ropes and pounding the body. Hyde was still getting through with jabs but it was a much more even fight. Riakporhe was storming forward in the eight landing clubbing head shots and suddenly a swelling formed by the left eye of Hyde which grew at an alarming rate and to a dangerous size and the fight was over as Hyde’s corner threw in the towel. Big win for the 6’5” Riakporhe, his seventh by KO/TKO, and it wins him the vacant WBA Inter-Continental title. Hyde was unlucky to lose to such a freak injury. He had won his last 11 fights and will be back when the injury heals. Chicago, IL, USA: Cruiser: Mairis Breidis (25-1) W PTS 12 Noel Gevor (23-2). Cruiser Krzys Glowacki (31-1) W PTS 12 Maksim Vlasov (42-3). Cruiser: Artur Mann (15-0) W PTS 10 Alexey Zubov (17-2). Breidis moves into the WBSS semi-finals with a controversial decision over Gevor in a poor fight where the styles and tactics did not gel with too little scoring and too much wrestling and head clashes. Breidis made the better start making good use of his jab and throwing rights. Gevor showed plenty of movement but was coming up short with his jab. In the second Gevor found the range with his jab and stopped Briedis in his tracks a couple of times with that punch. He also used quick footwork and upper body movement to frustrate the attacks from Briedis. The third was a better round for Breidis. He scored with lead rights before finally getting his jab working whereas Gevor was ignoring his jab and was given a stern warning for a deliberate punch to the back of the head. Gevor had his jab working in the fourth. He rammed the jab into the face of the advancing Breidis but then ruined his good work by twice deliberately landing punches to the back of the head of Breidis and was deducted a point. After four rounds and with the deducted point taken off the scores from the judges was 40-35, 39-36 and 38-37 all for Breidis. The fifth was a poor round with both fighters doing more missing than hitting and there were clinches and head clashes throughout the round. Every time Gevor lunged in his head ended up under the arm of Breidis. In the sixth. Breidis was having trouble with the strong jabbing from Gevor in this round and he was having no more success in countering the jab in the seventh and left hook from Gevor was the best punch in the sixth and a right was the best in the seventh. The pattern of throw a couple of punches and then lunge inside continued in this round. Gevor did some good work on the outside with Breidis waiting too long to let his punches go. After eight rounds the Judges still had Breidis in front with scores of 77-74, 77-74 and 78-73. Again there was very little clean scoring from either fighter making it a close round but Gevor was working hard and just seemed to do a little more than Breidis. A clash of heads resulted in a nasty vertical gash over the right eye of Gevor. Punch and lunge continued to be the tactics in the tenth. As usually Gevor’s head ended up under the left arm of Breidis and this time the referee deducted a point from Breidis for holding Gevor’s head there. The eleventh was another low scoring round. Neither fighter really landed a substantial punch. Gevor twice complained about headwork by Breidis but was guilty of punches to the back of the head. The twelfth was a disappointing end to a disappointing fight. Breidis was the more composed in his work with Gevor throwing wild swings so the Latvian took the last round. Final scores from the judges were 116-110, 115-111, and 114-112 all for Breidis. The former WBC champion will meet Krzys Glowacki in the final but looked a lucky winner here. There was so little sustained action in any round which made the fight difficult to score and the three judges only agreed the scoring in three of the twelve rounds. Gevor, who now wants to be called by his birth name of Norair Mikaeljan, was very much the outsider here but he gave Breidis plenty of problems and looked worth at least a draw. Glowacki scores emphatic win over Vlasov in this WBSS quarter-final. In the first round Vlasov made good use of his longer reach and sneaked home a couple of straight rights. The harder punches came from southpaw Glowacki who seemed to shake Vlasov temporarily with two lefts. The second was a close round. Vlasov worked hardest and threw more punches scoring with a neat burst of hooks. Glowacki was picking his punches and scored with left counters and just edged the round. Vlasov was doing good work in the third connecting with his jab and getting through with straight rights but with just seconds to go in the round after they both landed good punches Vlasov went over. It looked to have been from a left from Glowacki but the video showed that their legs were tangled and Vlasov overbalanced trying to avoid the punch. He was unhurt and protested the count and the bell went when the eight count was complete. The fourth saw both fighters scoring well. Vlasov was throwing more but Glowacki was more accurate and his counter lefts were the power punches. After the fourth scores were 39-36 twice and 40-36 all for Glowacki. Vlasov got back into the fight by out working Glowacki in the fifth but the Pole took the sixth with stiff jabs and some solid hooks to the body and although the seventh was a fairly balance round it was another one to Glowacki on the basis of his harder punches. A tired looking Vlasov had abandoned his jab in the eighth and at one point was wrestled to the floor. Glowacki was the one doing the scoring and he landed some hard kooks to the body. After eight rounds the Pole was ahead on all cards at 79-73, 78-73 and 78-73. Both fought like tired man in the ninth with Vlasov improving his accuracy to claw his way back into the fight and he outlanded Glowacki in a tenth that saw some furious exchanges late in the round with Vlasov outscoring Glowacki. The Pole’s strength gave him the eleventh. Despite suffering a gash on his left cheek and a cut over his left eye under his left eye Glowacki landed some powerful lefts to have Vlasov holding on. The Russian came back in the twelfth. He had that bit more left in the tank and kept pumping his arms with Glowacki only firing back with tired punches. Scores 118-110, 117-110 and 115-112 all for Glowacki. This had been a gruelling entertaining fight and Glowacki was a clear winner. He goes on to meet Breidis in the semi-finals and wins the interim WBO title. After losing to future WBO champion Gilberto Ramirez back in 2015 Vlasov had compiled a run of twelve wins and was No 2 with both the WBC and WBA and can still play a part in the division once the mists of the WBSS disperse. Mann wins an open entertaining fight with wide unanimous decision over southpaw Zubov. In a lively opener Zubov was moving well and scoring with quick jabs but just before the bell a powerful right cross from Mann put Zubov down. Zubov was badly shaken and when the eight count was over Mann scored with more head shots and put Zubov down again with a right cross. Zubov did well to make it to his feet and the bell went as the eight count was finished. Despite the two knockdowns the fight was far from over and Zubov staggered Mann with a right in the second. From there these two contested an entertaining contest with Zubov the busier and more accurate but Mann the heavier puncher. Zubov worked tirelessly with his jab and was more than happy to stand and trade. The heavy rights from Mann were more eye-catching and were enough to get him the decisions but the scores did not give enough credit to Zubov’s gutsy display after that near disaster in the first round. Scores 98-89 twice and 96-91 for Mann. The Kazak-born German Mann, 28, is ready to move up and take on tougher tasks. Michigan-based Russian Zubov had won his last seven fights. 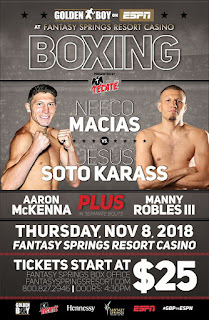 Indio, CA, USA: Super Welter: Jesus Soto Karass (29-13-4,1ND) W PTS 10 Neeco Macias (17-1). Feather: Emilio Sanchez (17-1) W TEC DEC 10 Enrique Bernache (24-12). Feather: Manny Robles (17-0) W PTS 10 Jose Santos Gonzalez (23-7). Super Middle: Demetrius Ballard (19-0,1ND) W Alan Campa (17-4,1ND). Veteran Karass outlasts younger Macias to take the majority decision. These two missed out on a commercial opportunity. They could have rented out the centre of the ring because after they touched gloves at the start of the contest neither ventured there again. Macias seemed to have decided to simply overwhelm Karass and he went straight into the attack forcing Karass to the ropes and the rest of the fight was a close-quarters scrap with Karass hardly ever getting his back off the ropes. Even a cut caused by a clash of heads in the second round did not get Macias to change his tactics. He kept pouring on the punches with Karass finding it hard to move from defence to attack but he was doing a better job of blocking punches and although outlanded his shots were harder. The slow start from Karass was not unexpected as he was having his first fight for a year but over the second half of the fight he gradually stepped up his punch output and although Macias kept throwing punches the power was with Karass. Scores 97-93 and 96-94 for Karass and 95-95. Karass, 36, had walked away after a run of five losses and a draw, all against top-notch opposition, but now there will be fights there for him. Californian “Rooster” Macias, 27, was fighting his first “name” opponent and came very close to victory. His stock-in-trade is all-out aggression so he is unlikely to change his tactics but some added experience will help him improve. Sanchez gets a technical decision over Bernache as the fight is stopped in the last round when Sanchez already had the win in his pocket. In an assured performance Sanchez always had control of the fight. He was able to use his longer reach to outscore Bernache snapping out his jab and connecting with right crosses. When Bernache did get past the jab he was outworked on the inside. Early in the final round it was decided that a cut over Bernache’s left eye was too serious for the fight to continue so with that round also being scored the cards read 100-91, 99-92 and 97-94 for Sanchez. This win constitutes the second brick in the rebuilding of Sanchez after he suffered a shock second round kayo loss against modest Eugene Lagos in March. The 24-year-old Californian is a former US Junior champion who competed at the Olympic Trials for the 2012 US Team. Seasoned pro Bernache is now 4-5 in his last 9 fights. Robles keeps his 100% record but in a flat performance as he gets a split decision over Gonzalez. It was Gonzalez who showed most fire early in the fight and Robles had problems settling as Gonzalez constantly switched guards and found gaps for his jabs. Robles just did not work hard enough over those early rounds but after stunning Gonzalez in the sixth he finally started to roll and was able to eat into Gonzalez’s early lead. It is questionable as to whether he did enough but two of the judges thought so and that was enough. Scores 97-93 and 96-94 for Robles and 96-94 for Gonzalez. The 24-year-old “Chato” retains the WBC NABF title. Boxing is very much in the blood for Robles as his father until recently trained Oscar Valdez and his grandfather was also a well respected trainer. Gonzalez is 1-4 in his last 5 fights but the opposition has been strong with Zolani Tete and Duke Micah both getting wins over him. Inglewood, CA, USA: Brandon Adams (21-2) W PTS 10 Shane Mosley Jr (11-3). Middle: Eric Walker (18-2) W PTS 8 Michael Moore (16-2). Middle: Tyrone Brunson (27-7-2) W PTS 6 Devaun Lee (10-5-1). Middle: Gerald Sherrell (10-0) W PTS 6 Morgan Fitch (18-3-1). Middle: Ivan Khytrov (18-2) W KO 4 Malcolm McAllister (9-3). Adams outclasses Mosley to win the The Contender series. After a close first round it was all Adams. He increased his work rate from the second and Mosley was never in the fight in any meaningful way. Adams had a disappointing Mosley under constant pressure and shook Mosley in the sixth in a big round for the winner. Adams was outboxing and out landing Mosley who was cut over his left eye in a clash of heads in the seventh when it looked as though a stoppage might be on the cards. Mosley hung on and made it the final bell but was well beaten. Scores 100-90 twice and 99-91. “Cannon” Adams, 29, lost to Willie Monroe in the final of the ESPN Boxcino Tournament in 2014 and to John Thompson in the final of 2015 Boxcino but will now pick up a $250,000 prize and get a top 10 rating from the WBA. Adams made his way to the final by beating Tyrone Brunson, Ievgen Khytrov and Eric Walker. After losing a split decision to unbeaten Australian David Toussaint on the Jeff Horn vs. Manny Pacquiao undercard Mosley was inactive until knocking out Devaun Lee, the only fight he had in the Tournament prior to this final. This was expected to be a close one but Walker simply outboxed Moore. Walker had big advantages in height and reach and was too quick and slick for Moore who never threw enough punches to be competitive. The clever movement and body punching from Walker saw him collecting the rounds. Moore had a good spell in the sixth but even then Walker banged back and won the round. Moore tried to stage a strong finish which resulted in some of the best action of the fight with Walker a winner by a large margin on all cards. Scores 80-72 twice and 80-73. Louisiana’s Walker, 35, only lost to Adams on a majority decision in the semi-final. His other loss is to Patrick Day, again on a close decision. Moore is just not active enough. He was inactive in 2014, had one fight each in years 2015, 2016 and 2017 so was a very strange choice for the Tournament. Brunson beats Lee in a contest between two “Contender” competitors who did not make the final. Brunson took the verdict by scores of 59-55 from all three judges. Now 33 Brunson still has that record of 19 consecutive first round wins at the start of his career and knocked out Kermit Cintron last year but was knocked out by Adams in May in the Tournament. Lee went out of the Tournament by a fifth round kayo against Mosley and has now lost his last three fights. This was the most competitive contest of the night. Both fighters were eliminated early in the Tournament but fought hard to make this a close fight with Sherrell getting a split verdict on scores of 58-56 twice for Sherrell and 58-56 for Fitch. Sherrell won his only Tournament fight but was unable to go further. Fitch had lost a wide unanimous decision to Yamaguchi Falcao before the Tournament and was knocked out in four rounds by Ievgen Khytrov in his first Tournament fight. Brooklyn-based Ukrainian Khytrov overcame the early scare of a cut over his left eye from a punch in the second round before showing his power with a fourth round kayo of McAllister. Khytrov was one of the favourites for the Tournament but after knocking out Fitch he lost to Adams in their semi-final. McAllister lost on points to Moore in his Tournament fight. Only the second win inside the distance for Beziers southpaw Ballesta. After a draw in his first pro fight he is now 17-0 1ND in his last 18 and is No 1 in the French ratings. Georgian Bliadze, 20, is 1-4 in his last 5 fights including three losses by KO/TKO. Accra, Ghana: Feather: Ray Commey (19-7) W PTS 12 Isaac Netty (28-12-1). Light: Felix Ajom (10-1-1) W Ben Ankrah (17-21). Commey wins the vacant Ghanaian title with points victory over Netty. Scores 118-111, 117-111 and 117-113 for Commey. Much needed win for Commey as in his previous two fighters this year he had lost to Isaac Sackey for the WBO African title and to Wasiru Mohammed for the Ghanaian super bantam title. Netty a former Ghanaian bantam champion and Commonwealth title challenger had won his last four fights. Prato, Italy: Super Middle: Dragan Lepei (16-1-2) W TKO 2 Alex Marongiu (7-11-1). Lepei wins the Italian title with stoppage of Marongiu. “Fury” Lepei was pressing hard and throwing bombs in the first but “Speed” Marongiu showed some neat defence moves to stay out of trouble. The second round was following the same pattern until a right hook sent Marongiu down heavily. He struggled to his feet but the referee decided he was in no condition to continue and waived the fight over. Ninth win by KO/TKO for Lepei who extends his unbeaten run to eight bouts. Marongiu falls to 1-4-1 in his last 6. Konin, Poland: Cruiser: Nikodem Jezewski (16-0-1,1ND) W PTS 8 Lance Bryant (12-5). Middle: Kamil Gardzielik (9-0) W PTS 8 Marcos Cornejo (19-5). Cruiser: Igor Jakubowski (1-0) W PTS 6 Oleksil Zhuk (2-1). Jezewski gets the win as he outpoints New Zealander Bryant. Jezewski boxed cleverly over the first four rounds. He scored well with strong, powerful counters constantly finding gaps in Bryant’s defence. A couple of times it looked as though Jezewski would break down Bryant for a stoppage but Bryant stayed in the fight. Jezewski fell away in the second half of the fight and Bryant was able to pinch a round here and there and was never really in any trouble after that as Jezewski ran out a clear winner. Scores 79=72, 78-73 and 76-75 but the last score looked too generous to Bryant. Jezewski’s next fight will be for the Polish title. Bryant, who was stopped in three rounds by Blake Caparello in August, was having his first fight in Poland. Gardzielik easily gets past Cornejo but in the end disappoints. The local fighter looked on his way to an early night when he floored the visitor with a right late in the opening round. Cornejo survived but took a pasting again in the second. Cornejo was down but the referee decided it was a slip but it looked a genuine knockdown. Gardzielik then dropped the pace and his work rate and that allowed Cornejo to go the distance without further scares. Scores 80-71 for Gardzielik on all three cards. The 26-year-old from Konin is still seeking his first inside the distance win. Four losses on the bounce for Cornejo. Yet another former high level amateur turns pro as Jakubowski outpoints Ukrainian novice Zuka. There was never any doubt that the Konin fighter would win but he struggled at times as he adjusts to the pro ranks. He took too many punches and seemed to tire early but had a strong last round. Scores 59-55 twice and 58-56 for Jakubowski. He was Polish champion at Cadet, Junior, Under-23 and Senior level, won a gold medal at the European Union Championships, competed at the World Championships and at the 2016 Olympic where he lost to Briton Lawrence Okolie. Miami, FL, USA: Light: Yuriorkis Gamboa (29-2) W PTS 10 Miguel Beltran (33-7,1ND). Light: Juan Manuel Lopez (36-6) W PTS 10 Cristian Mino (19-3). Welter: Harold Calderon (18-0) W KO 7 Emiliano Martin (16-3). Cuban Gamboa returns to action with a win as he outpoints fading Mexican Beltran. Gamboa looked sharp from the start. Although it was his first fight for almost a year Gamboa was on target early with his jab and late in the first he put Beltran down with a right hook. A promising beginning but it flattered to deceive. Beltran survived and was never really in any further danger in the fight. Gamboa continued to showcase his excellent skills outboxing the aggressive Mexican in every round but not really upping his work rate or pressing his attacks hard. It was a case of Gamboa needing the ring time and not wanting to take any risks against an opponent who posed no real danger. Gamboa was content to just work to the bell and take the win. Scores 100-89, 99-90 and 98-91 for Gamboa. At 36 time is not on Gamboa’s side. It seems unfair to say that in winning the WBA and IBF featherweight titles and WBA interim super feather and lightweight titles he has under achieved but his outstanding amateur career and early pro performances seemed to promise so much more. Inside the distance losses to Terrence Crawford and particularly Robinson Castellanos put question marks over his dedication so he will have to win something big and this his last chance to do so. Beltran set off with a 27-1 1ND start to his career before losing a split decision to Roman Martinez for the WBO super feather title in 2012. Since that set-back he has gone 6-5 and lost to some very ordinary opposition. “Jaunma” Lopez also gets back into the action. He scores four knockdowns but has to settle for a points victory over Argentinian Mino. In between the knockdowns Mino was actually quite competitive but Lopez’s power was just too much for him to overcome. Punches from southpaw Lopez put Mino down twice in the third. The first knockdown came from a southpaw right hook and the second from a left. Another left hook put Mino down in the fourth but the Argentinian shook Lopez with a right in the fifth. Lopez 36-6 (32) scored his fourth knockdown with a body punch in the sixth. From there Mino managed to stay on his feet and forced Lopez to work hard to the end. Scores 96-89 twice and 97-88 for Lopez. The former WBO super bantam and featherweight champion walked away after inside the distance losses to Mikey Garcia, Francisco Vargas and Jesus Cuellar before returning to the ring in March when he was stopped by Jayson Velez. He has now challenged Gamboa to a fight and that may happen in March. Mino’s domestic victims had been very low standard and this his third consecutive bout outside Argentina sees him gets his third loss. Tokyo, Japan: Super Fly: Ryuichi Funai (31-7) W TKO 2 Victor Olivo (15-3-1). Funai wrecks poor Olivo inside two rounds. Funai took the first with some strong jabs and then floored Olivo with a right cross in the second. Olivo somehow made it to his feet and was allowed to continue but was dropped immediately by a right hook and the fight was stopped. The 33-year-old from Tokyo has won his last seven fights. Olivo suffers his first loss by KO/TKO. With the help of the magic IBF ratings elevator Funai went from No 7 to No 3 without fighting. With positions 1 and 2 vacant that made Funai the top rated fighter but he could not be put into the mandatory spot because he had not beaten someone in the IBF top 10. No problem-Olivo steps on the elevator in the basement i.e. not even in the IBF top 15 and the magic elevator takes him to No 7 even though he had not fought since beating the 4-2 Irving Fierro in June. By beating “No 7” Olivo Funai qualifies to challenge Jerwin Ancajas. Wonderful how efficiently an elevator works when there is a sanction in fee looming. Corregidora, Mexico: Super Feather: Andres Gutierrez (37-2-1) W PTS 12 Ramiro Blanco (18-4-3). Light: Isaac Cruz (16-1-1) W TKO 3 Jose Felix (36-4-1). Gutierrez wins the vacant interim WBC International title as he takes every round against a game but outclassed Blanco. Gutierrez was able to find gaps in the Nicaraguan’s defence in every round slotting home jabs and connecting with powerful uppercuts. Despite his total dominance Gutierrez was unable to add to his impressive total of inside the distance wins. Blanco showed a good chin and was always willing to trade but took a beating. Exhaustion saw him spitting out his mouthguard three times for which he lost a point as well as losing every round. All three cards read 120-107 for Gutierrez. The 25-year-old Gutierrez was unbeaten in his first 35 fights before losing a majority decision to Cristian Mijares in 2016 for the WBC Silver title. He challenged Abner Mares for the WBA feather title in October 2017 but lost a wide technical decision. This is his second win this year and he is No 13 at feather with the WBC. Three of Blanc’s losses have been on his travels in China, Switzerland and now Mexico. Surprisingly easy win for Cruz against former WBA title challenger Felix. 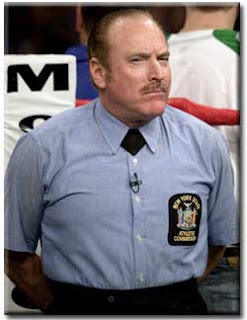 He put the more experienced Felix down three times before the referee called a halt in the third to save Felix from further punishment. “Pitbull” Cruz, 21, was taking a big step up in quality of opposition but gets win No 13 by KO/TKO. He is 10-0-1 in his last 11 fights. Felix, who lost to Bryan Vazquez for the secondary WBA super feather title in 2014, then put together a run of eight wins but has fallen back now with 3 losses in his last 4 fights. Gliwice, Poland: Heavy: Artur Szpilka (22-3) W PTS 10 Mariusz Wach (33-4). Light Heavy: Pawel Stepien (12-0) W KO 9 Dmitry Sukhotsky (23-7). Middle: Maciej Sulecki (27-1) W TKO 2 Jean Hamilcaro (26-10-3). Szpilka survives last round crisis to win on a split decision over fellow Pole Wach. Southpaw Szpilka just edged the first with his superior speed overcoming the height and reach advantages of Wach but the bigger man got through with a heavy right late in the second. Szpilka again used his speed and skills to outwork Wach in the third but was trapped on the ropes and had to absorb a couple of hard punches in the fourth. Szpilka was in control for much of the fifth but again Wach connected with some power shots late in the round. The fast pace he was setting seemed to catch up with Szpilka in the sixth and he allowed his hands to drop resulting in some success for Wach. It was Wach whose work rate dropped in the seventh. He landed a hard right to the body but a left hook from Szpilka was the best punch of the round. The eighth and ninth were close with Szpilka in control early in the rounds and Wach dangerous late with rights. After nine Szpilka seemed to have the fight won and all he had to do was see out the final three minutes. Easier said than done as Wach was launching fierce attacks. Late in the round a right from Wach put an exhausted Szpilka down. He beat the count but was in a bad way. There were just forty seconds left in the fight with Szpilka out on his feet but he managed to make it to the bell. Scores 97-93 and 95-94 for Szpilka and 96-93 for Wach. After a knockout loss to Deontay Wilder for the WBC title and a stoppage by Adam Kownacki Szpilka had rebounded modestly with a win over Dominic Guinn in May this year but a loss here would have been a huge blow. With so much heavyweight action going on Szpilka has put himself back in the mix. Naturally Wach is looking for a return as he tries to rebuild after inside the distance losses to Alex Povetkin and Jarrell Miller. Stepien climbs off the canvas to get his best win so far. The first three rounds were close as Stepien countered the aggressive early attacks by Sukhotsky. The Russian had a big fourth round as he connected with some good body punches and then floored Stepien late in the round with a left hook. Stepien was up quickly and made it to the bell with no further scares. The impetus was now with Sukhotsky and he attacked strongly in the fifth and sixth but by the seventh Stepien had clawed his way back into the fight. In the ninth a left hook staggered Sukhotsky and a series of punches put him down. Sukhotsky was hurt but he seemed really to be able to get up in time only to misjudge the count and despite his protests the fight was over. The Pole makes it eleven wins by KO/TKO and his seventh in a row. Kazak-born Russian Sukhotsky was knocked out in five rounds by Adonis Stevenson in a fight for the WBC title in 2014 but at 37 he is a long way from world class now and this is his third loss on the bounce. Frenchman Hamilcaro was expected to provide a reasonable but not too difficult task for Sulecki but was blown away in two rounds. Sulecki was already finding the target with some hurtful shots in the first and a body punch dropped Hamilcaro in the second. The Frenchman beat the count but from there it was a massacre with Hamilcaro down three more times before the fight was stopped. Sulecki easing his way back after his loss to Daniel Jacobs in April. He will be looking to get into more big fights after his New York showing. Fifth loss inside the distance for Hamilcaro who was stopped in six rounds by Josh Kelly in December. Guaynabo, Puerto Rico; Light: Felix Verdejo (24-1) W KO 2 Yardley Armenta (24-12,1ND). Verdejo signals his return as he obliterates Mexican Armenta inside two rounds. Verdejo was hunting Armenta down in the first with Armenta under a constant barrage and rarely getting off the ropes. Early in the second a left hook to the chin dumped Armenta on the canvas and the fight was over. The 25-year-old Puerto Rican was tipped as a future world champion as he rattled off 23 straight wins. He was rated No 1 by the WBO so the mandatory challenger to Terry Flanagan. The fight was all set for 16 September last year but had to be postponed due to an injury suffered by Flanagan. Verdejo was then injured and when he recovered he was put in a keep busy fight against Mexican Antonio Lozada in March this year only for Lozada to do the unthinkable and stop Verdejo in the last round. After a couple more fight it is expected that Verdejo will finally get a title shot. Ninth loss by KO/TKO for Armenta who was halted in two rounds by Richard Commey in August. Ekaterinburg, Russia: Middle: Artem Chebotarev (6-0) W PTS 10 Javier Maciel (33-8). Super Light: Georgi Chelokhsaev (16-1-1) W PTS 10 Gaybatulla Gadzhialiev (6-1). Russian Chebotarev hands out a solid beating to seasoned Argentinian Maciel to win the vacant WBO Inter-Continental title. Scores 99-91 twice and 98-92. The 30-year-old Chebotarev was Russian champion four times, won a bronze medal at the World Championships and gold at the European Championships. He also won an AIBA Pro Boxing title and competed at the 2106 Olympics so some good grounding. Former Argentinian champion Maciel is now 2-2 this year with the other loss coming against Willie Monroe Jr in August. Chelokhsaev wins the strange vacant Eurasian Boxing Parliament title with close verdict over fellow Russian Gadzhialiev. Although he floored Gadzhialiev in the first round Chelokhsaev had a battle on his hands and only just took the verdict on scores of 96-93 twice and 95-94.The Russian champion Chelokhsaev put together a run of seven wins in a row by KO/TKO but has now had to go the distance twice in his most recent fights. Gadzhialiev has already fought in Azerbaijan, Argentina, Puerto Rico and the USA as well as Russia and he had won his last seven fights. Marcos Paz, Argentina: Super Welter: Rodrigo Maizares (7-3) W PTS 10 Henrri Polanco (13-4-1). Minor upset as Maizares easily outscores Polanco to win the vacant WBC Latino title. Southpaw Maizares led from the start finding the target throughout the fight with his jab and following lefts. Polanco just never got into the fight and in his frustration landed a very low punch in the fifth and was deducted a point. A static Polanco never posed a threat as Maizares closed the fight strongly for an emphatic victory. Scores 97-92 twice and 100-89 for Maizares on the three cards. Maizares is building a small run as this was the fourth win in a row. Argentinian-based Dominican Polanco was 3-0-1 in his last four fights. Argentinian champion Clavero adds the South American title to his collection with victory over Cordoba. Clavero won this one on the back of a knockdown and a standing count in what was mostly a close fight. Cordoba used some skilled work to build a slight lead but in the sixth he was put down by a body punch. In the seventh Clavero had Cordoba in serious trouble and a stoppage looked likely but the referee gave Cordoba a chance to regroup by applying a standing count. The remaining rounds were close but both fighters dropped a point in the last Clavero for a low punch and Cordoba for spitting out his mouthguard. Scores 113-111 ½ twice and 114-110 for Clavero. The new champion is 3-1 in fights this year. Cordoba was on a good run being 7-0,1ND in his last eight fights. Sydney, Australia: Light Heavy: Reagan Dessaix (16-1) W TKO 2 Steve Lovett (17-3,1ND). Important domestic victory for Dessaix as he halts Lovett in two rounds. The tall 22-year-old “President” Dessaix moves to eleven wins by KO/TKO and this is tenth win in a row as he retains the WBA Oceania title. He is No 15 with the WBA. Dessaix was a good level amateur winning six Queensland State titles, two Australian Youth titles and competed at the World Youth Championships. Lovett tried his luck in the USA but after back-to-back losses to Craig Baker and Lionell Thompson returned home and had won his last two fights. Sydney, Australia: Super Feather: Joel Brunker 34-3) W TKO 3 Rivo Rengkung (37-28-6). Brunker starts his rebuilding with stoppage of experienced Indonesian loser Rengkung. Two of Brunker’s losses have been against world class opposition in Lee Selby and Josh Warrington but a defeat in July to New Zealander Nort Beauchamp was a surprise. Twelfth loss by KO/TKO for Rengkung. Santo Domingo, DR: Light: Jackson Marinez (15-0) W TKO 10 Jesus Arevalo (27-4-1). Feather: Hector Garcia (10-0,1ND) W KO 2 Robin Zamora (13-5,1ND). Super Light: Alberto Puello (16-0) W RTD 3 David Bency (14-10-1,1ND). 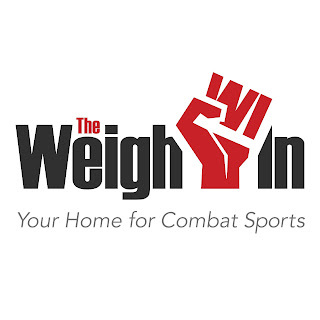 Light Heavy: Felix Varela (17-2) W PTS 10 Bryan Perez (11-1). Marinez much too good for Mexican Arevalo and after controlling the fight all the way he turns on the power in the tenth for a stoppage. Arvelo kept taking the fight to local boxer Marinez but he was leaning too far in with his jabs making himself an easy target for counters from Marinez. By the fifth Marinez was the one coming forward and landing left hooks to the body of Arevalo .and he had Arevalo in trouble on the ropes at the bell. Marines continued the beat down in the sixth with Arevalo reduced to wild swipes and Marinez dominated the seventh eighth and again had Arevalo in trouble on the ropes at the end of the ninth. Arevalo rallied in the tenth but then body punches from Marinez had him backing off. After a spell of showmanship Marinez then drove Arevalo back to the ropes and the referee had seen enough and stopped the fight. Local boxer Marinez was making the first defence of the WBA Fedelatin title. Arevalo was overmatched last year in losing to Cristian Mijares and Yvon Mendy and was never really in with a chance in this fight. Garcia blasts out Zamora in two rounds. Both fighters are southpaws but there the resemblance ends. Former amateur star Garcia had some problems with Zamora in the first round but was unloading heavy punches in the second. Zamora poked out a weal right jab and Garcia came over the top with a stunning left which put Zamora on his rump and he sat out the count . Garcia, 27, won a silver medal at the PanAmerican Games and competed for the Republic at the 2016 Olympics. This is his eighth win by KO/TKO and he takes Zamora’s WBA Fedelatin title. Zamora had won his last five fights. Southpaw Puello is very tall for a super lightweight and Nicaraguan Bency was giving away a ridiculous amount in height and reach. When Bency tried to get inside Puello was landing left counters and when Bency stayed outside he was getting nailed by long jabs and straight lefts. Bency did a bit better in the second. He was willing to take punches to get inside and he scored with some hooks. Puello was still using his jab to score at range and punishing Bency with lefts as the Nicaraguan marched forward. Puello started to look for Bency in the third and was coming forward scoring with left hooks and straight rights. The fight was halted due to a cut over the right eye of Bency. After a long examination by the doctor the fight was allowed to continue amazingly Bency’s corner man had climbed onto the ring apron and was about to daub Vaseline onto the cut when the referee pulled Bency away so that the fight could continue. Worried the fight might be stopped Bency threw himself forward slinging punches and paid for it as counters from Puello twice sent him staggering. Bency did not come out for the fourth due to the cut. Puello, the Dominican “Wasp” is rated No 5 by the WBA and No 15 by the WBC and is not being rushed. Bency had won 3 of his last 4 fights. Varela gets the win but has to come from behind. The former interim WBA champion found novice Perez a much tougher foe than expected. He was heading for an upset loss after eight rounds but he staged a strong finish as Perez tired and escaped with a very close unanimous decision. Scores 96-94 for Varela from all three judges. After losing his interim WBA title to Dmitry Bivol Varela was then pushed further down the ratings after losing to Sullivan Barrera. This is second win this year but fellow-Dominican Perez, who had never been past the sixth round before this fight ,looked worth a draw and will be hoping for a return. Nuremberg, Germany: Middle: Wanik Awdijan (24-1) W PTS 10 Maono Ally (8-3-1). Awdijan wins the vacant IBF Youth title with decision over Tanzanian Ally. Awdijan used a sharp jab to keep the aggressive Ally out over the early rounds. It was the fourth before Ally really made any impression and he was wild with his punches. Awdijan stuck mainly to the jab as his right hand had been in plaster until a few weeks before the show so he used it sparingly. He was a comfortable winner on scores of 97-93 twice and 99-91. The Armenian-born Awdijan had also suffered a shoulder injury earlier in the year so is now hoping to be injury free and more active. Ally had won 5 of his last 6 fights and did his job here of giving Awdijan ten rounds of work. Cave, Italy: Super Feather: Michael Magnesi (13-0) W PTS 10 Giuseppe Carafa (10-3-1). Fighting in his home neighbourhood Magnesi retains the Italian title as and outpoints Carafa. The aggressive start from Magnesi almost overwhelmed Carafa. In the first round he made Carafa stumble with a right hook and then floored him late in the round with another right. Carafa made it to the bell and used some good skills to stay in the fight. Magnesi continued his storming tactics and Carafa was warned in the sixth for holding and rocked late in the seventh by a combination. Carafa was being forced to stand and trade punches and the eighth and ninth were filled with torrid exchanges but Magnesi’s harder punch saw him on top to the bell. Scores 99-90, 99-91 and 98-91 for Magnesi. The 23-year-old local was making the first defence of the national title and will now look for an opportunity to fight for the EU title. Carafa falls to 1-3 in his last 4 fights. Fight of the week (Entertainment): Anthony Crolla vs. Daud Yordan and Glowacki and Vlasov also provided plenty of entertainment. Fight of the week (Significance): Oleg Usyk in ending Tony Bellew’s career and putting the heavyweight division under notice. Fighter of the week: Usyk. Punch of the week: The left hook from Usyk that ended his fight with Bellew and on the same show the straight right from Ricky Burns that ended his fight with Scott Cardle was a bit special. 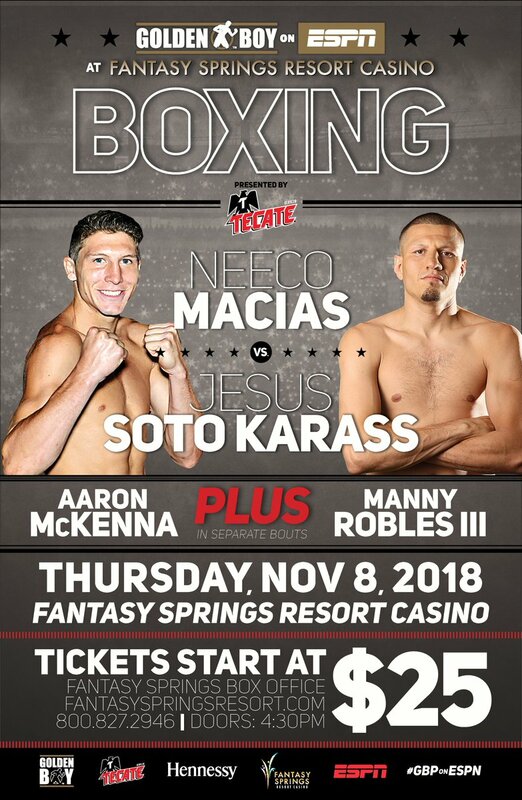 Upset of the week: No biggies although Jesus Soto Karass was not expected to beat Neeco Macias and Isaac Cruz did well to beat favourite Jose Felix. Prospect watch: No one I have not already named in previous reports really stood out. Support The Weigh-In: Your Home for Combat Sports by Shopping World Wrestling Entertainment (WWE) Product!